The first and most critical aspect of an accessible home is getting into it. Usually, there are one or more steps up to an entrance, which make getting into the home difficult or impossible for a person using a wheelchair. Since we recognize that not everybody can hire an architect to custom-design a ramp for their house, we offer the following information which may help you get started. Please bear in mind that this is general information, not tailored to a specific location. The ramp details are ones we have used before in several locations, and they result in a ramp which is strong and stable, and we believe it complies with applicable codes in Michigan for single-family residences. However, you or your contractor should check with your local code official to be sure there are no unusual local requirements, and should adapt the designs to your particular circumstances. For free ramp design information, including generic drawings and details of ramp construction, download the MAH Ramp Info file (PDF, about 500kb). For free general information about accessible home design (including abbreviated general design info on ramps, but not construction details), download The Accessible Home (PDF). Since this information is being provided free of charge, by using it you agree to indemnify and hold harmless Michigan Accessible Homes, Cornerstone Design Inc, and their owners and employees for liability resulting from the resulting construction. A good source for additional ramp design information is The Minnesota Ramp Project, which can be reached at WheelchairRamp.org. 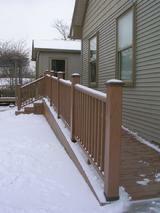 They promote a modular ramp design which we have not tried but which appears well-designed. Portable ramps can also be purchased or rented; check with your DME (durable medical equipment) supplier or the Yellow Pages, or do a Web search on modular ramps. They are usually made out of aluminum, so are more expensive than wood ramps but have the benefit that you can take them with you if you move. Your County or City may have a Community Development department that funds ramps and other modifications for low-income households. MSHDA, a department at the State of Michigan, has a loan program to pay for home modifications. More information can be found at the MSHDA website. Rebuilding Together or Christmas in Action. Both organizations (which both evolved out of Christmas in April) do construction projects on low-income homes, typically only one day a year. You would need to apply and be accepted. Disability organizations such as Centers for Independent Living, or Easter Seals, may have programs or be able to point you to local programs that can assist with ramp construction. See our Links page. All content copyright Michigan Accessible Homes & Cornerstone Design Inc, 2010, unless noted otherwise.